We set out this summer with the intention of sailing whenever we could and learning the vessel's and our own idiosyncrasies. We had a wonderful time, and I wouldn't change a minute of it. Yet, somehow we only managed to sail a dozen times or so. 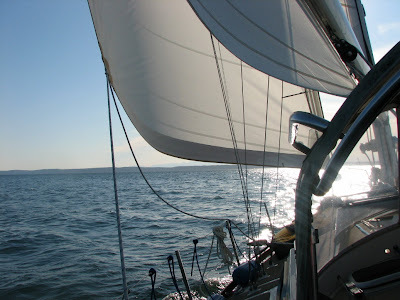 Nomadness moves beautifully under sail, but more often than not we motored. Why? Mostly due to lack of wind, or late starts with few options for anchoring, thus pressure to get somewhere by such and such time. And the most frustrating of all: the winds weren't blowing in the right direction. How absurd! Beating our way for hours into the wind in narrow inland waters and still not being able to arrive before dark trumped our love of sailing. Another thing that comes to mind in reflecting on the summer, is how much I don't know and how far from ready I truly am. Yes, I sailed a few times on my own (with Steve below of course) and I know how the plumbing works! I have internalized a lot of sequences for procedures that seemed confusing before (like the eight steps to take a shower), and I have a vague idea of what to do when the motor doesn't start. I know the basic functions of most of the electronics on board. And I know what every line in the cockpit does. But I still can't unfurl the main on my own. We haven't practiced man over board drills. We haven't practiced heaving to. I still haven't been offshore. I don't know if I'll get seasick. We have accomplished a lot, but we have a long way to go next year. Gotta keep working those learning curves! Steve has gotten clear on the priorities of the ship's systems and has tackled some huge new projects to ready the boat. I have become clear on the priority of developing my sailing and navigating skills. When I read about women who set out with their partners and know nothing about the operation of their boat, I find it not only sad, but very foolish. We have to rely on each other and trust each other's judgment. This trust can only be built gradually, brick by brick from solid decisions and successful actions, into a foundation that will allow us the freedom of letting go when we need to. We can rest in the knowledge that our partner can carry the load for awhile if we need him/her to. We have to be able to depend upon one another without becoming co-dependent. Dependency. What a loaded word. It has almost become a dirty word in our culture, and even more so in some subcultures. Dependency is viewed as weakness while self reliance denotes strength. I believe we must depend on each other. Nobody can do everything. Sure some can survive all alone on a boat or in the wilderness and that is commendable, but to thrive, our human souls need interaction and a community in which to grow. In the coming times, communities of folks will need to band together and not only for practical reasons. We need each other to make us laugh, to open our minds, to teach us new skills, to nurse us, to challenge us, to introduce new ideas, and to sing new songs that raise our spirits in the darkest times. To be able to depend upon one another is a gift. To be of aide, assistance, and to give support to one another creates an opportunity to exercise our own highest and best selves. If we all go it alone, how will we ever develop greater kindness, generosity, charity, tolerance, and love for humanity? What does all this have to do with sailing and flotillas and drama and art? Everything. It is all related. How we live, what we do, why we do it, and who we share it with, all determine the quality of life we seek. Whether it be at sea in flotillas, or on land in communities, whether through art, science, or even geek expressionism, we have to chase the big questions. We are symbolic as well as practical. Our journeys are mythic. I have been reading a lot of great blogs lately that discuss sufficiency, self reliance, and simplicity, but I want to make sure that in the process of saving ourselves, we don't cut ourselves off from sharing the joy of life, the glee of kindness, and the bliss of love. We really do need each other. I like the way you write. Its introspective and feels good. Your personal search reminds me of a similiar life several friends of mine and I had in the early seventies. I had a 33-foot wooden sailboat the I sailed around the San Juans and the Canadian Inside Passage all the way to Southeast Alaska. For those three summers I was part of a loosely-knit flotilla of minimalist sailors based in Washington and Canada. We called ourselves the "Freak Fleet" and actively sailed from about April 1 through about the first or second week of November when everybody scattered to find a Winter palce to hole up in. Some boats opted for the city life in Campbell River, Nanaimo, Port Townsend, Friday Harbor or Bellingham where they worked to replenish their money. Some spent the Winter on the hook in a good protected hole and skiffed to town or a local cannery for supplies. During the Spring, Summer and Fall we sailed the hell out of our boats, got a lot of our food from the beaches or the sea and about five or six times each Summer got together at some deserted beach where we all anchored up in huge rafts. Ashore was all about playing music, dancing around the fire and drinking crappy wine. Way too much of it. Almost all the boats were fairly simple with kerosene lamps, wood-fired heat, hand-pumped water and simple sail handling systems. It was a time I'll never forget. I guess I don't really have a point in telling you all this. You seem like you're headed to a good place. I will say, though, that the people who had the most fun were the people with the simplest boats with the simplest systems. No one needed to go through eight steps to take a shower. We took sponge baths, hung a "Solar Shower" up in the rigging on sunny days, or visited the nearest cannery or fish camp for a quickie. Shower, that is. Don't let the complexity of shore life follow you to sea. You'll become a better sailor for it and get closer to the elemental forces around you. Thank you for your comment. It sounds like I'm a few decades too late for your group. Ahhh the good old days! But seriously, I would love to hear more of what you're doing now. I have an email link on my profile page; if you send a note there, I can email you back. Hi Sky, Love the picture! Let me know when your back up Thetis Island way! Great post!!!!! Keen observations regarding land-based approach carrying over to your summer travels on Nomadness. "Sure some can survive all alone on a boat or in the wilderness and that is commendable, but to thrive, our human souls need interaction and a community in which to grow." I wholeheartedly agree. I've always said the heart is a communal organ and the idea that we get there -- anywhere -- alone is a myth.